Abbey Assaroe was founded in 1178 and completed in 1184 by the Cistercians monks who came to it from Boyle in County Roscommon. It was dedicated it to God and St. Bernard by Flaharty O'Muldorry, Lord of Tirconaill (Donegal) and it seems he was patron of the abbey at this time. Flaharty died there in 1197 at the age of 59. In 1227 the abbot of Assaroe was involved in the conspiracy of Mellifont (1216-1228). Donal Mor O'Donnell, King of Tirconaill became a monk at the monastery. He died there in 1241 and was buried in the grounds of the monastery. 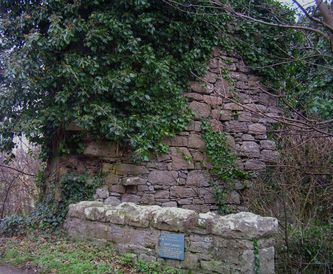 The monastery was burnt in 1377 and John O'Donnell and his son were slaine there in 1380. The abbey suffered many attacks over the following number of years culminating in it being plundered in 1398 by Niall Og O'Neill, the King of Tyrone. The abbey estates were granted out to English lords but the monks continued to reside in the abbey. The monks lived on there in this fashion until after the Flight of the Earls in 1607 when the last of the monks were driven out of the abbey. It fell into decline in the 17th century and now all that remains of the abbey is the west end of the church, part of the west gable and a section of the south wall. 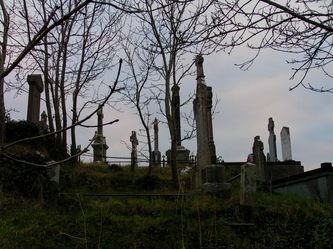 As you are facing the ruins you will see a newer graveyard to your left. This, together with an adjoining farm, would have formed part of the abbey grounds. 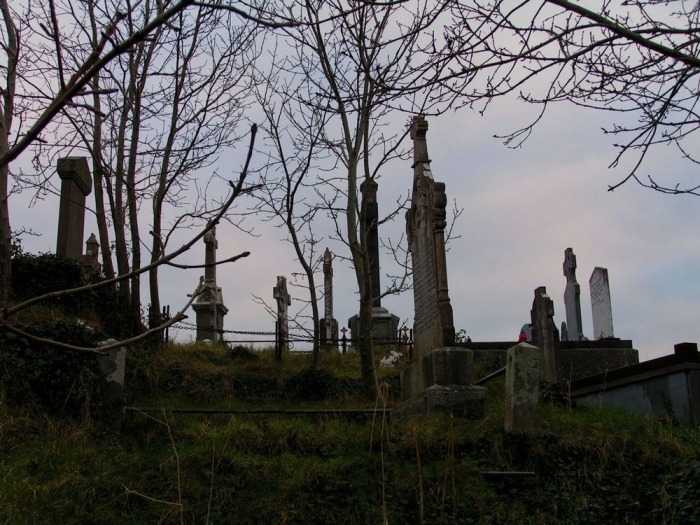 The last abbot of the abbey, Abbot Quinn is buried in the old graveyard there. Location: Take the Rossnowlagh road out of Ballyshannon. A short distance along the road you will see a small bridge with a green plaque indicating where the abbey stood. The carven-stones lie scatter'd in briar and nettle-bed! The only feet are those that come at burial of the dead. And heaven itself is now the roof of Abbey Assaroe. But gray at every season is Abbey Assaroe. This man was of the blood of them who founded Assaroe. To God and to Saint Bernard - where at last they came to die. Shall rest among the ruin'd stones of this their saintly place. Along the rough and crooked lane he crept from Assaroe.